This luxurious five star estate is a place for escape and indulgence. 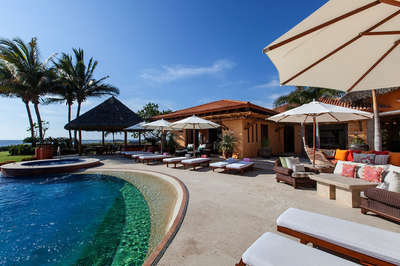 Situated on the white pristine sands of Punta de Mita and the breathtaking Pacific Ocean, this lavish estate will sweep you off your feet. Located within the gated community of El Banco, it consists of seven bedrooms in the main house, with gym equipped with step machines, treadmills, bikes and weights, sauna, and media room. Each suite offers something unique be it a spectacular view, a secret garden or a gorgeous private terrace among other things. On the back of the property you will find a casita with two bedrooms which would be ideal for teenagers who want some privacy or for your personal staff. Each suite has a terrace or garden and is equipped with flat screen televisions, internet access and en suite bathrooms. This magnificent estate offers beach access in addition to the phenomenal free form pool that runs across the entire width of the property. The staff is out of this world and will attend to your every need from picking you up at the airport, to cooking the most delicious meals for your family to enjoy. Full house reverse-osmosis water purifying system. Satellite television with American and Canadian channels.